My final project for Physical Computing and Intro to Computational Media was an interactive film that I worked on with Jina Jung called Dating Stories. This interactive film is a comedic, 'choose your own adventure’-style narrative directed towards adults. The lead actress in the film, Christine, has two choices from her search on a popular dating app: will she go on a date with Douglas or Jared? Ultimately the individual observer gets to decide. By using the physical, interactive board, the observer has the ability to choose what path the date goes on in the film by moving the wooden piece from node to node. Their choices and full narrative are executed on the screen. We didn't initially have a signal for the 'start' state on the board. This confused some people because they didn't know if their action had an effect when they put the wooden piece on the board. 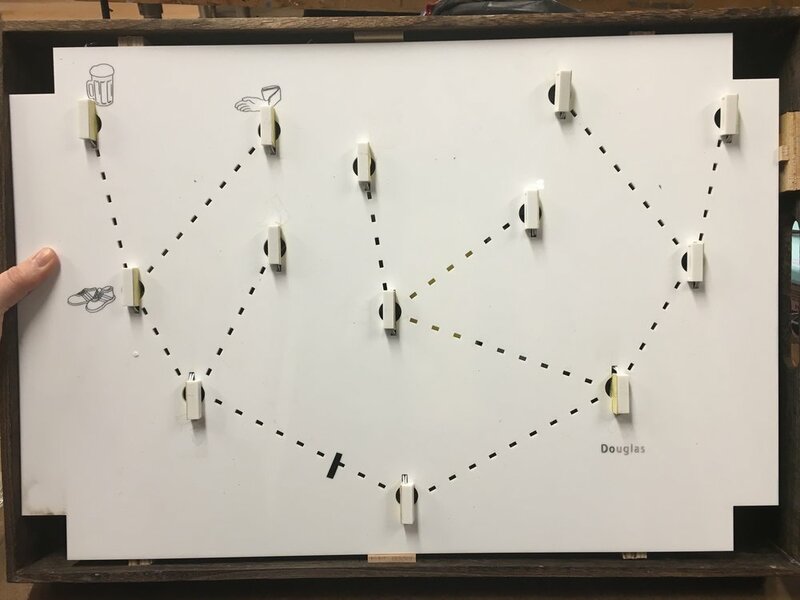 Originally, the first video started playing when the individual put the wooden piece on start, but there was no response on the actual board informing the individuals that they were doing to correct interaction. So after the user testing, a week before the project was due, we implementing a pulsing glow of the two LEDs around the start node that disappeared when you placed the wooden piece on start. 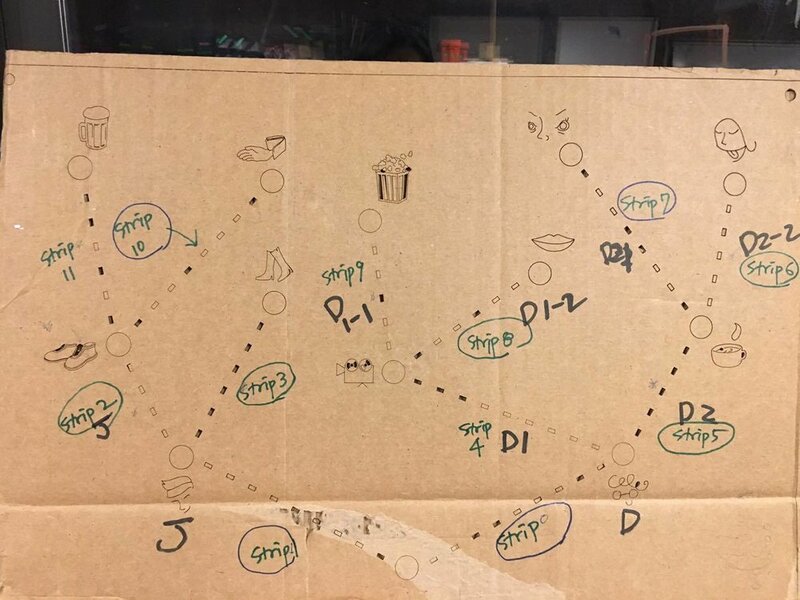 We also cut the first scene down so that the first choice happens almost immediately after the user puts the wooden piece on start so that they understand from the first second how they are to interact with the board. When the user is to choose a path, on the screen there is a split screen of the two options, and the two paths light up indicating that the film and board are waiting for their selection. This feature was very successful in user testung and really informed the user as to when they were to interact. This is what the sensor plate looks like from above, with the magnetic sensors. This was before we added the LED strips. They would go on top of where the paths are shown here. The holes helped to direct where each LED should be so that they can be seen in the top plate. We put at magnet in the base of the wooden piece so that when it was placed on a node, the sensor would send the signal via serial communication to p5.js. Here is my ICM post that talks a little bit more about my experience with the coding side of the project. There was serial communication from the arduino to p5.js and back to the arduino which was something I haven't done before. I learned a lot of new things while creating this project. Including how to think through and break down the code into small chunks to be able to create your desired effect. This isn't something we really go over in class, so I am happy that I am starting to get an intuition for this. We submitted our project to ITP's Winter Show. With 20%, the most popular ending was when Jared forgets his wallet and Christine has the pick up the tab after he drinks more than his fair share of beers. Jared: Oh shoot... I think I forgot my wallet. Do you think they take Venmo? Jared: I can Venmo you?